Lennie Mahler | The Salt Lake Tribune Travelers pass through the expedited security line in Salt Lake City International Airport, Tuesday, March 4, 2014. 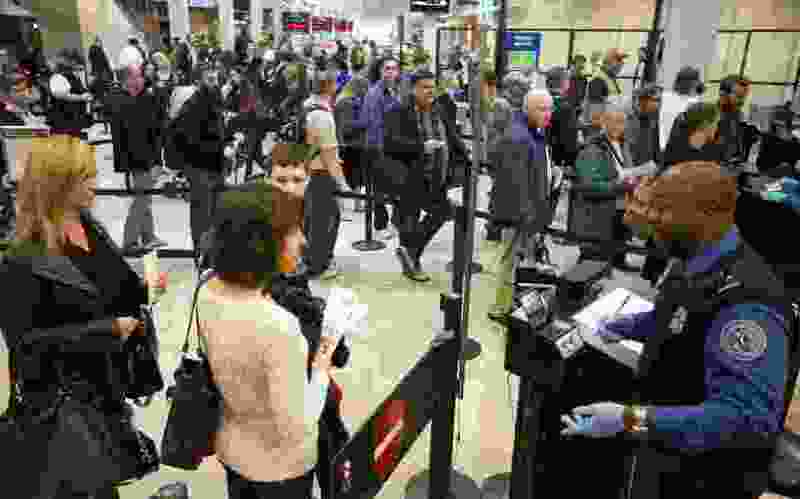 Enrollment in the new TSA Pre-Check program grants passengers an ID number for $85 that allows access to the expedited security line for five years. When legislators meet in a promised special session next month to address medical marijuana, they may also try to fix a problem that could in the next couple of years prevent Utahns from using their driver licenses to pass through airport security. The Legislature’s Transportation Interim Committee took an initial step Wednesday to make that happen — endorsing a bill to make the fix, and calling for it to be considered in the expected special session. The problem comes because the U.S. Department of Homeland Security is requiring Utah to reissue all of its driver licenses by Oct. 1, 2020 — to include a gold star on the front as a sign that Utah reviewed birth certificates or passports to prove license holders are U.S. citizens. Without the gold star — which allows officers to see compliance at a glance — DHS is warning it would no longer accept Utah driver licenses at airport security or to enter federal facilities after the 2020 deadline. The problem is, the Legislature in 2010 banned any further steps to comply with the federal REAL ID Act. Because of that state law — which was a protest over unfunded federal mandates — state officials say they cannot now legally add the required gold star without action by lawmakers to allow it. Sponsors of the protest legislation, HB234, have both moved on from the Legislature. Former Sen. Margaret Dayton, R-Orem, retired earlier this year and then-Rep. Steve Sandstrom, also R-Orem, left in 2012. State officials say the law presents a problem that could cost up to $5 million if the state moves slowly to address it, but perhaps only $3.4 million if it moves quickly. The cost might be even less, an estimated $2 million, if it acts in a special session next month. That’s because more soon-to-expire licenses could be replaced with new ones containing a gold star at the same time drivers renew licenses, rather than sending a duplicate with the proper symbol later. Christopher Caras, director of the Utah Driver License Division, said his agency could add the star to new licenses beginning in December, if the special session authorizes it in November. “It will be critical to citizens of Utah who want to travel,” he said Wednesday. Caras added that every month of delay will cost about $80,000 in additional costs. Gov. Gary Herbert promised earlier this month to call a special session next month regardless whether the Proposition 2 initiative on medical marijuana is approved by voters to consider compromise legislation hammered out in weeks of behind-the-scenes negotiation among state lawmakers, faith leaders and medical cannabis advocates.